A new goodness menu has launched at Ultra Brasserie, which has outlets at Emaar Square and Dubai Marina. Dedicated to plant-based, superfood-rich diets, the new menu has been developed by Ultra Brasserie’s head chef to cover breakfast, deli and dinner options. For vegans and vegetarians, enjoy dishes like the vegan burger that consists of a potato and pea patty on a vegan gluten-free bun finished with fresh tomato, vegan basil pesto, oak leaf, alfalfa and beetroot ketchup. The smashed avocado on sourdough with chili and coriander on a vegan sourdough base complete with paprika, beansprouts and basil pesto is also recommended. Next there’s the new ‘Root to Stem’ menu that features options like ‘wilted wonders’ – wilted beetroot leaf on sweet potato rosti topped with two poached eggs and hollandaise sauce. In addition, you’ll find ‘ultra power bowls’ and freshly pressed juice options available at Ultra Brasserie. Details: See ultra.ae or call 04-2775644 for more information. Wild & The Moon has welcomed new homemade, all-natural, plant based ice creams to its menu. Free from any refined sugars, ice cream flavours include matcha banana, tangy citrus, blueberry and acai, vanilla and thyme, turmeric and mango, and more. These creamy delights rotate flavour daily at both Alserkal Avenue and Robinsons Department Store. 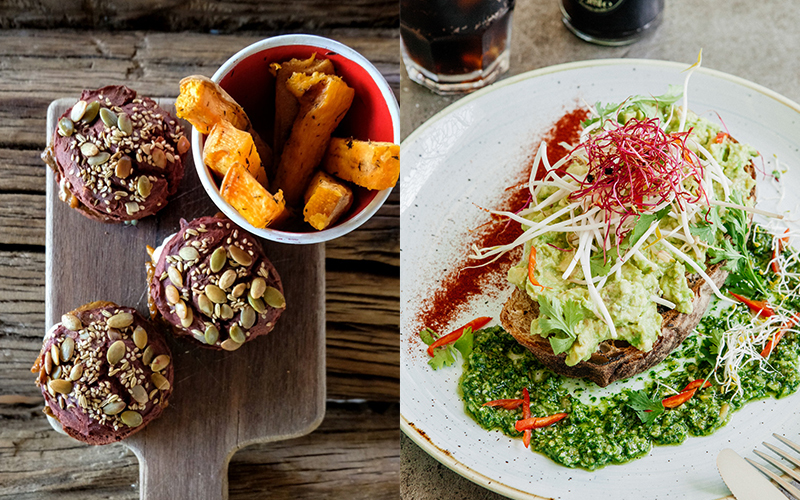 Details: Visit wildandthemoon.ae to see Wild & The Moon’s full menu of tasty treats. Plant-based café and well-being spot, Life’n One on Jumeirah Beach Road has introduced an all-new take on the vegetarian burger, with the launch of its ‘vurger’. The vurger is new on Life’n One’s all-organic menu and is made up of oyster mushroom stuffing drizzled in barbecue sauce, wrapped in a beetroot gluten-free bun. The meal is complemented with a portion of air-fried sweet potato fries, coupled with the café’s homemade, sugar-free tomato ketchup. Details: E-mail info@lifenone.com, visit lifenone.com or call +971 56 534 2899. If you’re looking for more vegan-inspired Dubai outlets, check out the city’s first ever vegan ladies night that has launched in Tecom.